Submitted for your consideration: A man, arguably with too much spare time on his hands, discovers that the brilliance of "Planet of the Apes" and "The Twilight Zone" came from one mind: that of Rod Serling. Most men would accept this simple fact and get on with their lives. Not this man. An obsession builds, not an obsession of the flesh but of the mind. He imports the entire "Planet of the Apes" movie into his Power Mac G4 along with strategic snippets of two episodes of "The Twilight Zone." Then his odyssey begins. 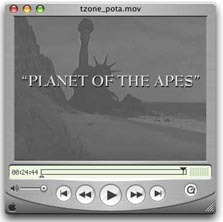 Using iMovie, he edits "Planet of the Apes" into a 30-minute episode of "The Twilight Zone," complete with fades where commercials would be, a perfectly appropriate closing narration by Rod Serling, and closing credits in the exact style of the classic TV show. Some edits are imperfect, but what endeavor of mankind's ever achieves perfection? Presenting "The Twilight Zone" Episode 157, "Planet of the Apes," superbly imagined by Roger Alford. Every now and then, I order a batch of Snapshot Cookies from ClubPhoto. The cookies aren't exactly the organic, free-range variety, but they're fun and always get a lot of smiles. A growing number of sites and services offer edible prints of one kind or another, and you can even order edible ink-jet paper and ink. Here are a few sites I've found in my research. IQ Durable's Edible ink. IQ Durable is a Phillipines-based company that sells a variety of edible inks. The site has an interesting backgrounder on the process of printing on food. PhotoFrost Edible Ink and Printers. No, the printers aren't edible, but you can use them to print edibles. And yes, kosher formulations are available. KopyKake. Here's an extensive site dealing with many aspects of edible imaging. They sell pens containing edible ink as well as edible inkjet ink and much more. Tasty Foto Art. Sells ink, printers, scanners, and more. The PhotoCake system. Looking to add photo phood to your bakery's product line? Check out the PhotoCake system of printers and supplies. Many of the edible ink systems rely on a carrier sheet. You begin by installing edible ink cartridges in your printer. (Canon printers seem to be the most widely supported.) Then, print on the special "frosting sheets" instead of paper. Finally, lay the frosting sheet atop a frosted cake, and the ink is absorbed by the frosting. Just add Rolaids! Disclaimer: I haven't tried or eaten any of these products. I'm just researching and reporting. If you have experience with these or any other edible output options, let me know. I hope your week is progressing better than mine. On Monday, we were evacuated from our home due to hazardous materials spill that occurred near us: a big rig carrying a load of chlorine and other nasties slipped off of California's narrow Highway 1, killing the driver and spilling some chlorine, creating a dangerous situation for our heroic local volunteer fire department, whose chief captured the grim scene with his digital camera. Anyway, the toxic spill turned out to be very minimal, and we were allowed back in our home on Tuesday. And I've been playing catch up ever since. So today, just a few notes and links of interest. AirPort Express tidbits. Over at MacCentral, my fellow Macworld columnist Chris Breen has been posting some great stuff about the AirPort Express, as has Macworld editor-in-chief Jason Snell. iPhoto 4.0.2. It's here! No, wait -- it isn't. Why not? Who knows? If Apple's CEO can be so admirably forthcoming about something as deeply personal as illness, Apple's product managers can be more forthcoming about the specific changes made in a maintenance release -- and about why that release is no longer available. Customers appreciate candor, and Steve Jobs always exhibits it. But when it comes time to describe software updates, candor devolves into meaningless phrases like "addresses minor issues." It's time Apple stopped patting us on the head and saying, "There, there -- it's all better now." Specifics never hurt anybody. UPDATE, 5 pm PDT. Apple has posted an iPhoto 4.0.3 update, with the following description: "This update addresses several issues with using multiple text rules in Smart Albums and it also eliminates some problems with creating iPhoto books in the German and Dutch languages. Additionally, 4.0.3 keeps users informed about new version of iPhoto that have become available." The grammar needs a little work, but the details aren't bad. I'm guessing the update fixes this bug, among others. I'm downloading it now. My visit to the Digital Village. I had a great time as a guest on KPFK's Digital Village program last Saturday, and the MP3 archive is now available for your listening pleasure.